Althea, Korean products which ships to Malaysia. Annyeong-Haseyo! & if youre not sure what that means, it means hello in Korean. In this post, im sharing to you about my experience shopping on Althea, the first Korean cosmetic online store which ships all the way to our homegrown, Malaysia. 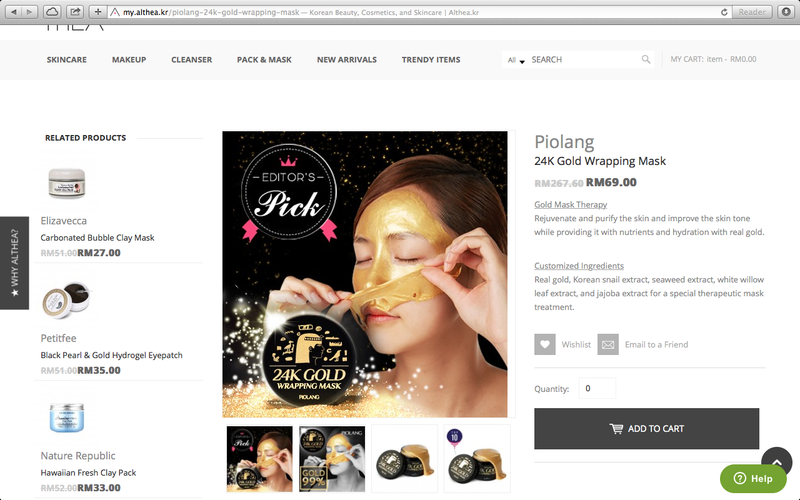 Im not sure about you, but Korean Cosmetic products are recently getting even more popular in Malaysia. Being the biggest country famous for their cosmetics (other than Japan), Korean cosmetics are actually famous for being reasonably priced AND suitable for our Asian skin and weather. So here, im telling you that I found this amazing site called Althea which sells Korean products way cheaper than the stores in Malaysian and the fact that they provide free shipping with a minimum purchase, this pretty much saves me the time and money to be travelling there instead. Did you also know that Althea is named after the Althea flower which is the national flower for Korea? So from the images above, you can see that the site has a really cute theme with their main colour of pink as their identity. How can anyone not love hot pink right? This is pretty much how the site looks like, and from my personal experience, its very user friendly too! Even instructions will be given on their site. And I found out that they even describe the product in English too in their description. Which is a major bonus cause some of the instructions on the product are mostly written in Korean. Thanks for thinking of that Althea, appreciate it a lot! Once you’ve decide what you want, all you need to do is add in to your cart and check out. Here are the few things that caught my eye, and personally I love how its all about GOLD. The 24K Gold Wrapping Mask is a steal since its more than 70% off! Get it before its gone! :D So, once you’ve confirmed your order review, it will automatically lead you to a payment page where you can use your visa card to proceed with payment. And that’s it, easy peasy! 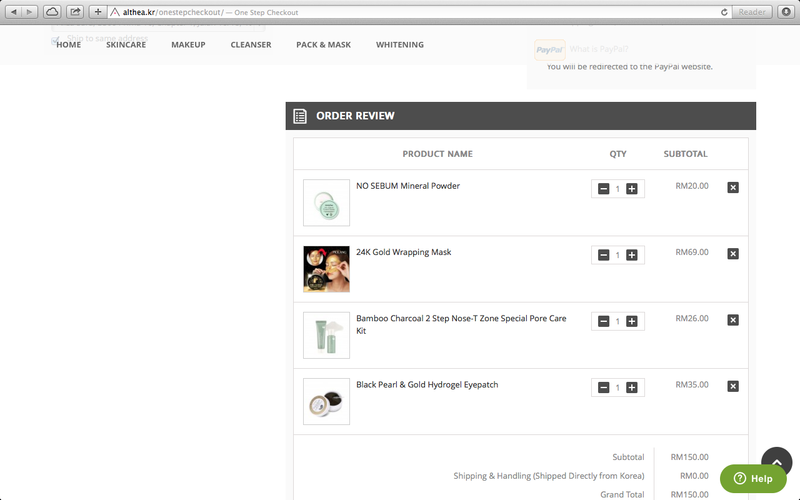 And since my entire order reached at an amount of RM150, its free postage! YAY! Now, the curious part was the wait. Since usually international shipping usually takes at least 3 weeks, but to my surprise, my parcel took me LESS THAN 2 WEEKS to arrive to my house. How efficient is that man?! BTW, I ordered on the 26th of June and it arrived on the 10th of July! LOVE LOVE LOVE! 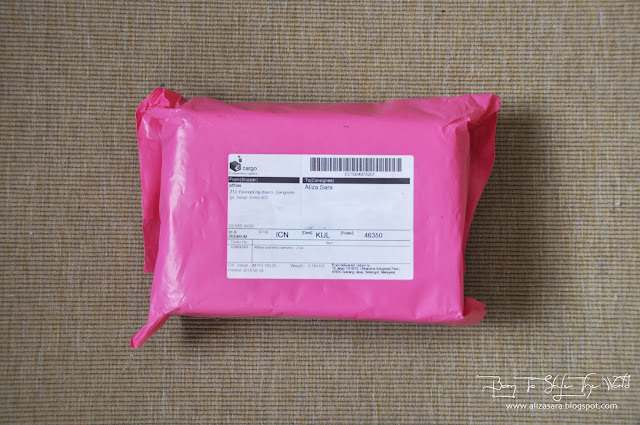 And if you haven’t realized yet, it arrived in a really Hot Pink parcel, which definitely created a statement to me. 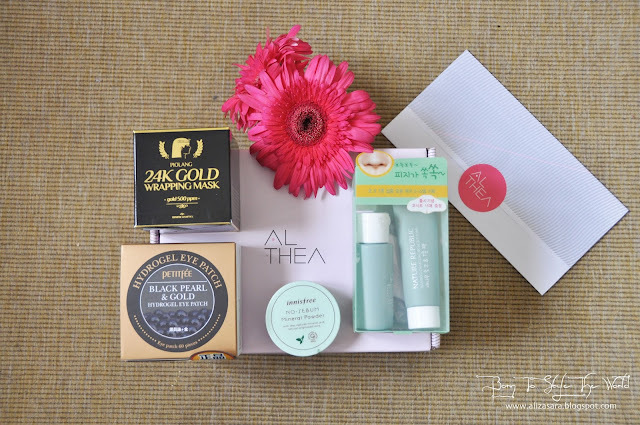 And when I took it out, even the box from Althea was pink too! It was nicely wrapped in bubble wrap to protect the box’s condition, thumbs up. The box was also pink! Now let the unwrapping begin! The minute I open the box, there’s an invoice slip to remind you what you’ve bought, including the price stated and the date of order too. I’ll be honest, this is my first time receiving such a perfect condition parcel which has been shipped over 20000 miles overseas! Im impressed. And if that amazes you wait till you see the content. Everything was arranged and wrapped perfectly in the box which i truly appreciate Althea for putting so much care into my parcel. All my items arrived in perfect condition, so if you planning to get it as a present for a friend, you dont have to worry about the parcel being damaged. As you can see, each product was nicely packaged in bubble wrap. How pretty can this be ?! Even each product was nicely wrapped. Told you it arrived in perfect condition. And thats it, please note that the prices stated is the price after discount. So my total damage from this haul would be RM150! (Extremely worth it!) 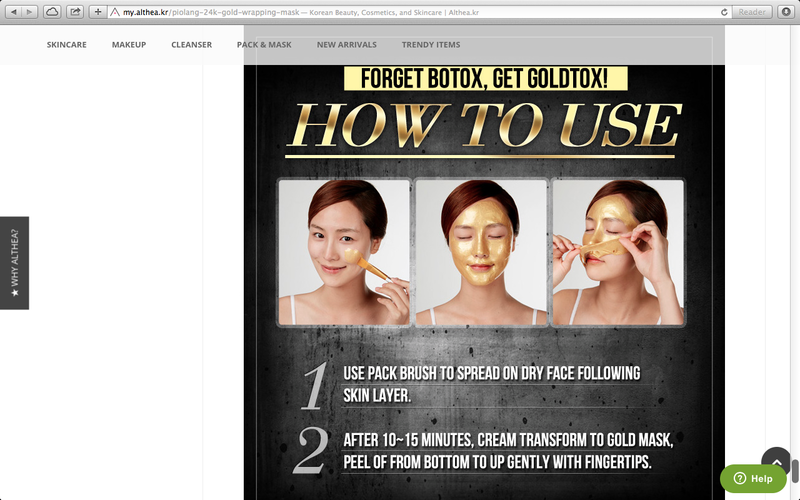 But to be honest, the 24K Gold Wrapping Mask was the one i was eyeing on the whole time. Cant wait to give a review on that. Me looking excited receiving a parcel from Korea. Well, im keeping this post short and simple, so that you can spend more time on Althea yourself. (I spent over an hour deciding on what to buy, since everything was way cheaper than getting the same thing in retails store here). Be sure to drop by their official website or their facebook page to keep yourself updated with promotions and offers all year round. Korean beauty product is always the best! Yet to shop from althea..
hehe.. nice right? I still thinking what to buy. For RM150 only and you can get so many of their great products. Will check it out at their website later. wow~~ i like ur photos here. yes, and I like althea too! 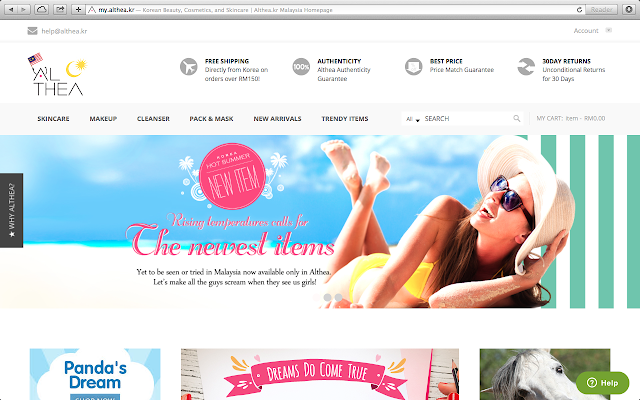 It's way to great for shopaholic like us! 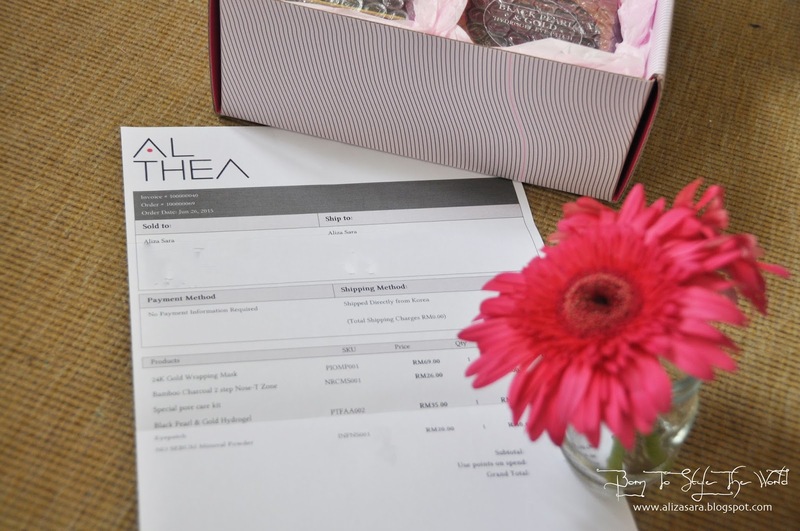 I am so stoked to try and purchase from Althea... Soon soon... Love the review girl! 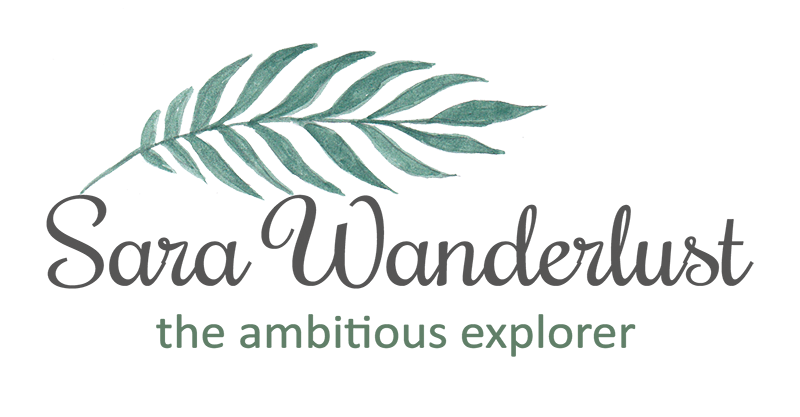 Planning a trip to PENANG with TRAVELOKA!